Cardiff kept up the pressure on Sky Bet Championship leaders Wolves as Joe Ralls' late penalty secured a 1-0 win at Middlesbrough. Ralls drilled home from the spot in the 84th minute after substitute Adama Traore was penalised for a reckless challenge on Nathaniel Mendez-Laing. The win keeps Cardiff in second position in the table, two points behind Wolves, and saw Neil Warnock's side bounce back after picking up just one point from their previous two games. Middlesbrough barely tested Bluebirds goalkeeper Neil Etheridge, and the Teessiders have slipped into the bottom half of the table after failing to win any of their last five games. 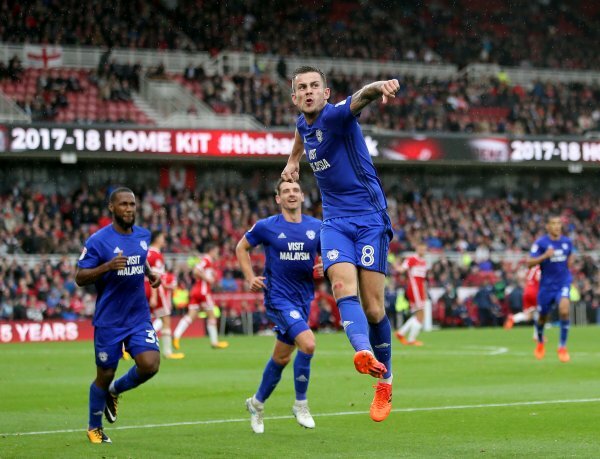 Boro have struggled in the early stages of a number of their matches this season, and they were on the back foot once again as Cardiff dominated the opening quarter of an hour. The visitors should have scored in only the fifth minute, but Danny Ward shot tamely at Darren Randolph's legs after the Boro goalkeeper had seen his attempted clearance charged down by Junior Hoilett. Ward went close again moments later, shooting narrowly over the crossbar after cutting in from the left-hand side, and the nervousness in the Boro ranks was exemplified by the sight of Daniel Ayala rolling a simple 10-yard pass straight into touch. Cardiff threatened again midway through the first half with Ward narrowly failing to reach Joe Bennett's dangerous low cross as he slid into the six-yard box, but Boro improved as the interval approached and gradually began to create chances of their own. 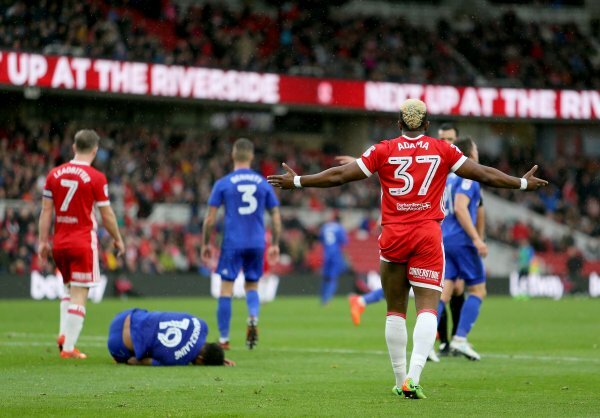 Britt Assombalonga fired over from the corner of the penalty area, before former Cardiff full-back Fabio da Silva also came close with a long-range effort. The hosts twice came within inches of opening the scoring at the start of the second half, with Stewart Downing responsible for both efforts. The former England international saw a goalbound drive deflect narrowly over the crossbar after flicking off the head of Cardiff defender Sol Bamba, before his curled free-kick from the edge of the area also picked up a deflection as it drifted narrowly wide of the left-hand post. Bamba was involved at the other end shortly after the hour mark, and the Cardiff centre-half was adamant he had scored after a penalty-box scramble. His prodded effort from Sean Morrison's square ball was hacked away by Assombalonga, who was standing on the goalline. Cardiff's players were adamant the ball had crossed the line, but referee Andrew Madley waved play on. Madley was involved again with seven minutes left, but this time his decision was rather more to the visitors' liking. 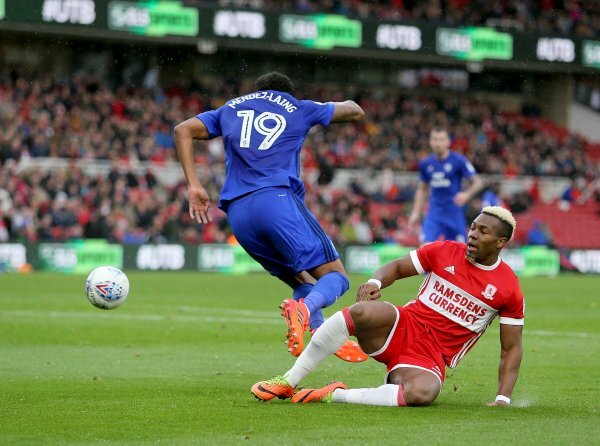 Traore flew into a reckless challenge as Mendez-Laing turned in the area, and the referee rightly pointed to the spot. Ralls drilled his spot-kick past Randolph, and Cardiff should have added a second goal in the dying seconds, only for Hoilett to head Mendez-Laing's cross wide of the target. Cardiff City: Etheridge; Manga, Morrison(Capt), Bamba; Peltier, Ralls, Bryson, Bennett; Mendez-Laing (Paterson 89), Hoilett; Ward (Bogle 89). Not Used: Murphy(gk), Tomlin, Feeney, Halford, Damour,. Middlesbrough: Randolph; Christie, Ayala, Gibson, Fabio; Leadbitter (Capt), Howson; Downing (Traore 78), Braithwaite; Fletcher (Bamford 67), Assombalonga. Subs Not Used: Konstanopouls(gk), Friend, Clayton, Fry, Johnson.